Jo Kessel is a journalist, travel writer, novelist (Lover in Law) and TV presenter. A qualified barrister who switched the bar for a career in journalism, Jo spent five years as a reporter and presenter for ITV London and has written for newspapers including the Daily Mail, Daily Telegraph, The Guardian and Daily Express. She also penned an anonymous column entitled ‘Diary of a Primary School Mum’ for The Independent. Married with three children, two years ago Jo’s life was struck by the sudden loss of her mother who died soon after suffering a catastrophic brain haemorrhage. In this guest post she talks about precious keepsakes left behind by the people we have loved and lost. My Dad’s about to turn 80. Cause for celebration you’d think, and indeed it is. Only it is also a day which will be tinged with sadness because my mother won’t be there. It was never meant to be this way. Nobody thought it. Dad was much older than Mum, much less fit than her and his body has been playing up for years. From his heart to his eyes to his back to his knee to the hip replacement from which he is currently recovering. But despite all these ailments and despite Mum having youth and good health on her side, life had other, less obvious plans. Two years ago, age 70, my mother went to bed one night, nothing untoward, and the next morning she just never woke up. 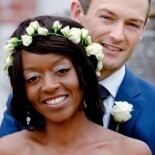 She’d suffered from a massive and ultimately fatal brain haemorrhage. It’s not been the easiest 24 months – there are moments I still feel I’m reeling from the shock. I have three young children – twins Nathalie and Gabriel (10) and Hannah (7) – and barely a day passes when I don’t shed a tear for the things my mother is unable to witness. Like my eldest daughter Nathalie (a tomboy who has traditionally refused to wear dresses) asking me to buy her a skirt for her grandfather’s 80th birthday party; like her twin brother Gabriel scoring 100 per cent in a maths exam at school; like my youngest daughter Hannah (who my mother claimed was the spitting image of her) singing a solo in a recent school play. And then there’s that other big loss, the loss of having my mother as a sounding board. From the bigger issues like schools and finances, to the more trifling: how do I make jelly? My mother’s advice was always invaluable. Despite the overwhelming grief and the feeling on some days that I will never get over it (and perhaps I never will) life does move on. My father has found a lady companion (oh how I wish I could discuss that with my mother) and we have gained an extra beating heart in the house – a hamster! And I have also learned a very important lesson. A couple of weeks ago one of my children’s friends was round on a play date and they accidentally knocked over a vase on the kitchen table. Not just any old vase, but one my mother had given me shortly before she died. It smashed onto the floor into a hundred, irreparable pieces. I could barely look at its broken remnants (nor my son’s friend for that matter) as I dumped it in the dustbin. If only this epiphany had come two years earlier. A couple of days after mum died, my daughter Nathalie showed me a woolly hat that my mother had bought her a week earlier when out shopping together. I’d snatched the hat and gasped, “You mustn’t wear it, because it would be dreadful if it got lost.” In fact, I’d gone a step further, buying an identical understudy to be worn instead of the ‘real’ hat, to avoid my mother’s gift being misplaced. Sadly, however, John Lewis had sold out and so I had to settle for the same hat in a different different colour instead. Nathalie has been wearing the understudy hat ever since, but ‘vase-gate’ has made me see things differently. It has made me cringe at my previous behaviour. But it’s never too late to turn things around, so I’ve now told Nathalie that if she wants to wear the ‘real’ hat before she grows out of it, then she should, without worrying about whether it gets lost. I’ve realised we should enjoy these memories in the moment, allowing my mother’s life and kindness to envelop us. Like this, we get to keep her love and presence in our everyday lives as well as our hearts. 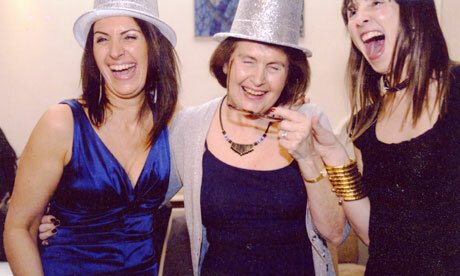 Jo Kessel, far right, with her mother and sister Karen in 2008. First of all- what a wonderful photo! My mother died at the age of 55 when I was just 25. Although she had been in poor health for ten years, it was a complete surprise because she had been feeling well for awhile. Like you and even though it’s been 35 years, I still feel myself reeling sometimes. My mom never got to meet my husband or my sweet daughters. I miss getting to ask her so many things- did she ever feel overwhelmed with life, what did she feel about lots of things- questions one asks as an adult child. My issue with my mother’s belongings was never wanting to get rid of anything at first. It took me many years to not want to lose anything she had touched. I haven’t become a hoarder, I just wanted to still hold and touch and love the things she loved. I have gotten over it. My broken object that helped me come to terms was the cake topper from my parents’ wedding cake that my husband and I also used. I opened the cupboard it was in one day and it flew out onto the floor in a million pieces (it was plaster of paris from 1947). As I sat on the floor weeping I realized, I had the memories and luckily a photo of it. This for me was a turning point. Now if I want to get rid of something I find it a good home and make sure I have a photo of it. If I could only get those photos in an album…! Thank you for sharing and letting me share. Hello Judy,I love your ‘taking a photo’ idea for things that have sentimental value……I think it’s hard, as mother’s ourselves, when our mothers aren’t here to enjoy our children, and also to find out how THEY did things when we ourselves were kids. At each different age as my children grow up, I’m now desperate to ask “was I like that? !” I do try to ask my father too, but he doesn’t seem to remember whilst I’m sure that my mother, like me, would have remembered everything down to the very last detail!! I believe that things as well as memories are so important in the grieving process. I still have two pairs of my father’s socks which I actually wear occasionally, wearing them makes me feel close to him. There’s something psychological about my feet being where his once were. However, one pair has now developed holes so I am wary that I will lose this closeness one day but it does not stop me wearing them. I think it wonderful that your daughter feels she will be taking Grandma to Grandpa’s party by wearing the hat. I truly believe that those we lose carry on living through those they left behind through memories & those people they interacted with throughout their life. I lost my father to pancreatic cancer fifteen years ago. It was a shock like your mum’s death Jo but not quite so sudden, we had fifteen days between the day he was diagnosed & the day he died. It gave us time to say some of the things people regret never having said. My dad at the age of 72 had retired less than two years earlier after having been a Vicar in Buckinghamshire for just over 30 years. He was very thought provoking and I always likened him to the then Bishop of Durham, the one who questioned the Virgin Birth, as he was always questioning and challenging people to think about their beliefs. Over the last few years of his life he had moved away from mainstream Christianity even more so and the discussions I had with him over the last days of his life, when he was not suffering the side-effects of painkillers, were thought provoking. The one thing that sticks in my mind was his view that dying is like moving to another town or village where you carry on living and then meet up again at some point in the future. We have had several other members of our family die since then and at every funeral I have thought that they have now met up with dad and told him all the news so he keeps up to date. He never had the chance to see my daughters, my brother married nor his son & daughter. However, I believe he knows. One part of my dad’s ministry that he was very good at was counselling the bereaved. He made great efforts to gain an insight into the people he performed funerals for even if he had never met them and personalised their funeral. He was also involved with the bereavement charity Cruse and helped set up the local branch. I was very lucky to have him as a father, he enabled me to deal with losing him through teaching me the importance of talking about ones feelings and letting go of emotions. It has also stood me in good stead through other life events I have faced over the years. Ben, I admire you for what you are doing with this blog and I know my dad would feel the same. It is important that more people learn the importance of dealing with the emotions they experience through the grief of losing someone close. If they are faced up to and acknowledged then the grieving process will be far smother than if they are hidden away and buried within oneself. Society as a whole also needs to change it’s perspective on grief. Lesley, I think you are absolutely right and I’m sure your brother would have loved to see these possessions being used and enjoyed. I have enjoyed reading your post Jo. I like the sentiment about using your mum’s things. My mum died suddenly aged 60 coming up to 18 months ago. At first I wanted to keep everything as it was, to not touch anything or use her things but I have realised I can’t keep a shrine and also it’s lovely to use her things and feel her with me. It sounds like you went through the same epiphany as me, and it’s kind of liberating I think when you do feel free to use these things without worrying about the consequences of them breaking or getting lost – I’m going to carry on doing this more and more………………. This entry was posted on March 20, 2013 by Ben Brooks-Dutton.